This extraordinary experience was made possible through our gracious hosts in Morocco, all of whom are part of the research network “LMI MediTer”, including researchers from the French research agency IRD and from universities in Marrakech, Rabat, and Agadir. Six local students (two from each university) joined us in the mountains, bringing to the table not only their own experience and curiosity, but also their much-needed skills in Amazigh (Berber) and Arabic. 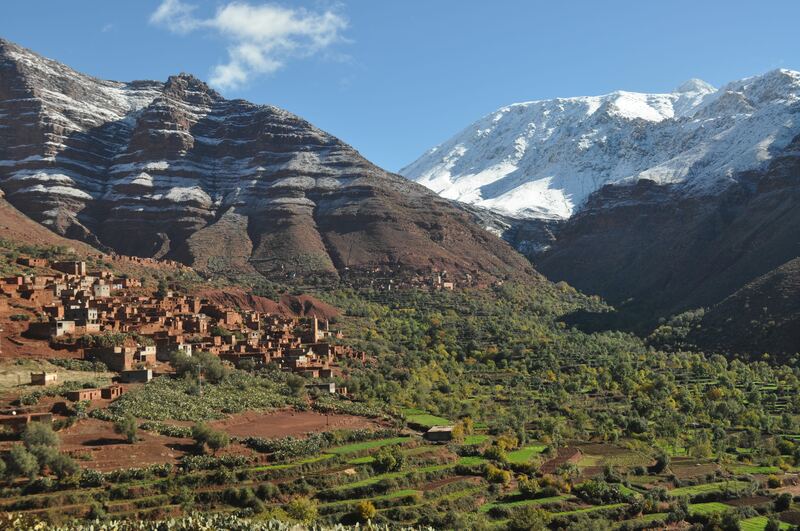 The villages of Aït Oucheg sit at 1600m altitude high above the Ourika Valley, where one of the main rivers flows from the snowy Atlas down to the Haouz agricultural plains around Marrakesh. Four main villages with mosques decorate the red mountainside, where the people work hard to cultivate verdoyant green agricultural terraces with potatoes, barley, lucerne, parsnips, walnuts, and more, bordered by narrow-leaved ash trees. The villages are in a period of change, with the recent arrival of a rough road, electricity, and even potable water to most households. But there are still plenty of donkeys carrying loads from and to the dispersed terraces, and numerous herds of sheep and goats heading out to nibble on the sparse grass. In such a short time our research opened more questions than answers, but certainly gave us a great insight into the issues facing the people living here. We heard of severe and long-lasting conflicts over access to certain potable water springs, just as we learnt about the intricate ways in which the villages cooperate over the distribution of irrigation water in this region with a long summer dry period. We saw how the villagers struggle with the rubbish that the easier transport of the road facilitates, and heard of the challenges facing many marginal rural communities with respect to migration for paid employment, the aspirations of the younger generation, and access to health services. The people welcomed us more than generously and with lots of laughter, and kindly spoke with groups of our students at length about their lives and livelihoods. The mountains welcomed us with their beauty, but challenged us as well with one very rainy day, another snowy day, and cold, cold weather – particularly indoors. We were lucky to be able to stay at a lodge (Gite de Tizi N’Oucheg) that could accommodate us all comfortably and feed us more couscous, tagine, and tea than we could ever want. If you are curious, at 9:15am on December 15, our students will give a public presentation at the University of Lausanne (Géopolis 2129). If you can’t make it, a film about water management in one of the villages was recently released to critical acclaim. It gives a good sense of the place. It is called “Les Berbères des Cimes” (teaser on vimeo, 5 different thematic excerpts here, watch full film on vimeo on demand for 3$ here). The film’s star, the owner of the Gîte, a certain Rachid, was “on tour” with the film in France while we were up in the village. On arrival and departure, we also got to see the city of Marrakesh in its post-COP22 conference extravagance, with flags and decorations, and newly planted gardens and newly re-paved roads. For this successful trip, I’d like to thank the hard work and enthusiasm of my Lausanne colleagues (especially Valérie Boisvert and Mialy Andriamahefazafy, but also Basile Gross and Marianne Milano), our colleagues in Morocco (Thierry Ruf, Mhamed Mahdane, Genevieve Michon, who all joined us in the mountains), as well as the co-directors of LMI-Mediter, Said Boujrouf and Bruno Romagny) who made this all possible. * MSc in Geography, Specialization in Development and Environment. This entry was posted on Tuesday, November 29th, 2016 at 9:31 am and is filed under Teaching. You can follow any responses to this entry through the RSS 2.0 feed. You can leave a response, or trackback from your own site. That is one wonderful report. Thank you!